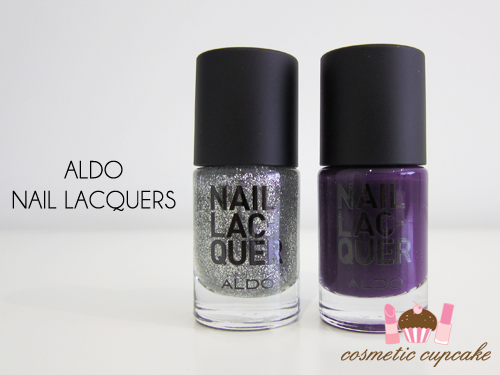 Aldo shoes recently launched a collection of 9 nail lacquers and today I have two from the collection for you - Deep Barney and Stardust. Keep reading to see swatches and my review! 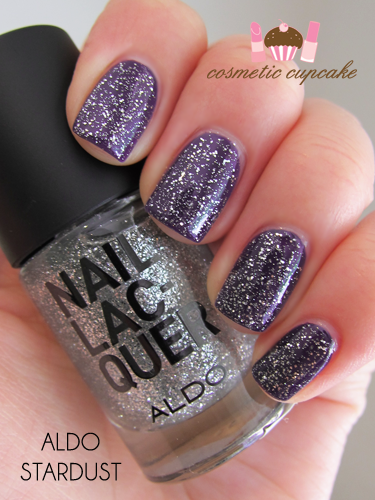 "Like our shoes, ALDO Nail Lacquer is carefully curated to feature the hottest shades and trends of the season. With a range of always-classic nail colours and neon hues fresh off the catwalk to match this season's accessories for a total fashion look. Made in the USA, the high quality ALDO nail lacquer colour pigments are perfectly calibrated in Germany and assembled in unbreakable bottles, with brushes and caps imported from Italy." Deep Barney is a beautiful dark royal purple that is almost jelly like in formula. It's somewhere in between a creme and a jelly and dries to a SUPER glossy finish. I LOVE the finish! As it's so glossy, as usual you can see me reflected in my nails haha. Being a purple it was a pain in the you know what to capture on camera so I had to tweak the colours to show you the colour accurately. 2 coats is pictured. Stardust is a sparse silver glitter in a clear base. It contains fine glitter as well as some slightly larger pieces. It dried to a glossy finish also. 2 coats is pictured. Overall: Deep Barney was a little tricky to apply as I experienced some balding. I suggest using a thicker 2nd coat (which I did) or a 3rd thin coat. The finish is just stunning. LOVE. Stardust is a wonderful glitter topper and I'm going to be reaching for it a lot I predict! 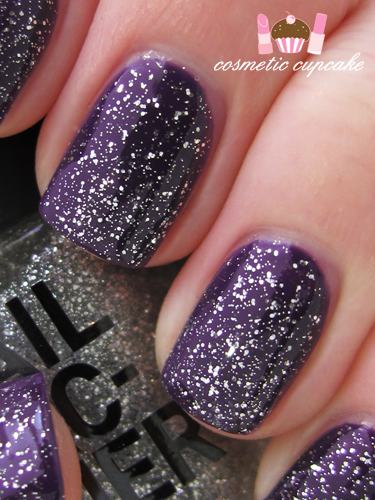 It's quite a sparse glitter and I often reach for something like this to give a mani a final glittery touch. It'd also be fantastic for a glitter gradient nail! It applies very smoothly and the glitter applies perfectly evenly on the nail which is fantastic. I'm itching to try out the other glitter in the collection Gold Digger. These are wonderful lacquers and I really enjoyed using them!! I found the formulas very good ( Deep Barney a bit tricky but still ok) and I love the high shine finish. The brush was great to use and no clean up was required at all. I'm digging the names ie. Gold Digger for a gold glitter, Type O for a dark blood red polish as it sure beats a numbering system that other accessory stores who venture into nail polish seem to do. The price point is very reasonable too which is great news for polish lovers. Aldo you've done a great job with your foray into nail polish! 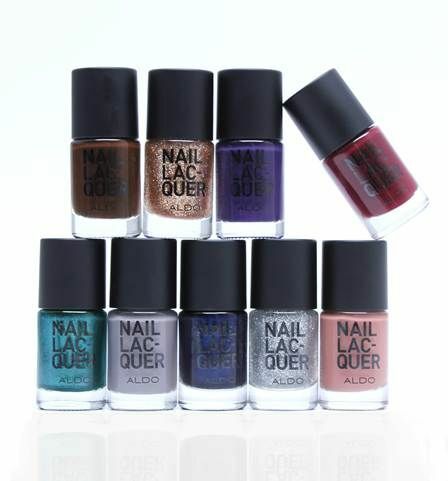 Details: Aldo nail lacquers are available in 9 shades from Aldo stores for $9.95. Oh wow, super pretty ones! The purple one rocks, but I actually liked the whole collection! Shoes & Nail Polish- I never thought it!!! LOL, I love the Deep Barney & the layering is wonderful too!! Pretty combo :D I like the glitter polish! 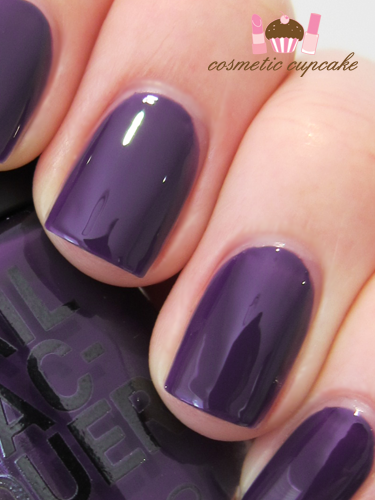 I'm not the biggest fan of cremes, but I'm falling in love with jellies, and Deep Barney looks gorgeous. The two polishes look great together. Pretty color. Had no idea Aldo had nail polishes. I'm in love with Deep Barney. It's such a classy colour! what a beautiful deep violet ! Love it. That's a beautiful purple color and the silver glitter on top just adds so much more spark to it! Love these, especially combined. Both colors looks delicious and I just can't help but imagine how would stardust look over something dark blue? Love the purple polish!! SOOOO GLOSSY!! I love the Deep Barney nail colour, so bold but so shiny!! You have the best nail shot/photos in all the non-professionally sponsored blogs I've ever seen! Lovely to see your level of commitment to detail. Your nails are nicely done unlike most of the nail polish shots I've seen where the paint job is messy and the nails/skin look dry. I doubted them before but they look so great! I'll definitely be purchasing!